Day 11: Leaf Challenge? or Drunken Artist? 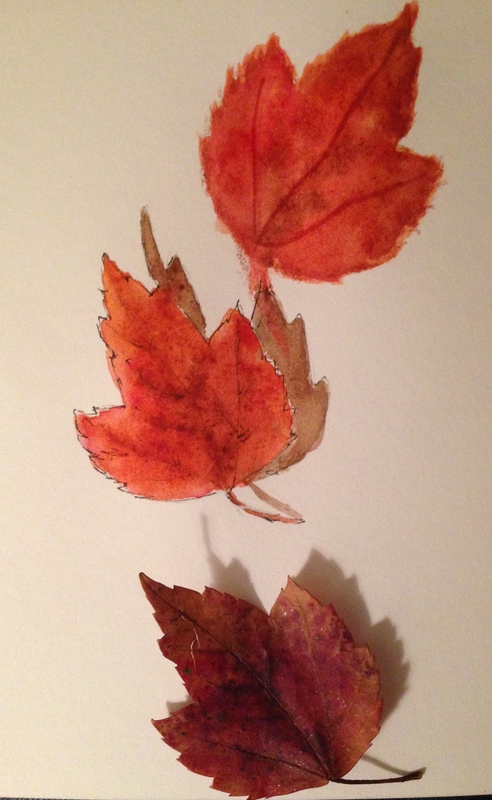 OK, so this wasn’t one of my better leaf paintings, but we all have those days, huh? I think the top one is Neocolor crayons and the next is my Cotman travel palette. I hope everyone has a wonderful Fall weekend and stays dry! Personally, this is perfect weather for so many things. All of the cozy things like reading, sewing, enjoying an old movie with someone cute…..even drawing and painting, with lots of lights added. 🙂 Peace. < Hear Ye, Hear Ye, Draw some Birdies? They are wonderful Ms drunken autumn! Happy happy Friday! LOL, same to youuuuuuuuuuuu my sweet! So far today: leaves 3, other subjects 1. Do you use water and brush over your neocolor? I like drawing with crayons, but I’ve never tried to do anything further with the drawings. Delightful and joyful sketch. Enjoy your Friday, Laura. Thanks, Sharon and you do the same! Wonderful! I tried a leaf yesterday–just an ugly thing I found on the ground in the dark. It’s pretty fun. I’ll try again. Nice work on yours. You are nailing the colors. Thanks, Kirk! I feel I have a long way to go, but I appreciate your encouragement, as always. I am amazed at what you are doing. I’ll be looking for more leaves as the days go on. They are a challenge! They are a challenge but sooo much detail and perfect for wet in wet watercolor washes. My advice is just let there be a bit of sheen and then drop in very small amounts of paint at first…..so easy to get some of those leaf effects with watercolor. I can’t imagine trying it in acrylic or oil. The water really does so much of the work for you! Man, these are some seriously good leaves! I personally think this is one of my favorites, Miss Drunken Artist xD . These seriously look crazy real! The middle one is really 3D and I love that, but to be honest, I like the top one best! Although it isn’t exactly 3D, for some reason there is something super enticing about that leaf. Maybe it’s that when looked at close up it almost looks aflame with the colors of fall. Idk, great job either way! Thanks so much, Evan! I really appreciate your kind comment! I think they are very good! I am enjoying seeing your work. Every time I see a leaf turning color it reminds me of your paintings. Great work! aw, that’s so sweet, Carmel! Thank you! Who says drunk art can’t be good art? These are just as lovely and lively as your other leaves! Happy Friday! Oh, we’re all twirling! I hope you’re twirling (in a good way) too, Jill! Happy Weekend to you! I think painting drunk maybe fun!! Maybe I’ll finally be able to be looser in my sketching. Lol. I think these are gorgeous! LOL, you should try it, Kari! No alcohol was consumed in the making of this particular painting, but you’d never know it, wouldja lol? awww….hehe! Ann, I think you and I are sisters. :))) Glad you like it. lol, not if the painting gets better! In my case, I just look like a drunken artist with this painting – but not in a good way lol! I think your leaves are very good and I like your fall colors. And what exactly is wrong with being a drunken artist? lol, nothing if it works! In this case, I just look like a way-too-drunken artist with this painting lol! oh my. yes, this fall weather makes me want to do so many things, and my art is beginning to lack. the leaves are getting started each day, but not finished. goodness. I think we need more hours in the day just to be able to enjoy and do everything we love. Can’t wait to see more of your leaves! Are you working on anymore? Happy Monday! Thank you, BB! Please offer whatever you would like – I love suggestions and thrive on them! Not offended in the least. Thank you! I just finished a quick one but honestly, time has been a thief of late. Sounds like, of us both. Oh so glad to know! Drunken artist? Ha the title intrigued me…. I always enjoy your leaf paintings! Thank you! I wish they were better, but the challenge is a good one!